A few weeks ago, when a nice big winter storm coated the San Gabriel mountains in a thick layer of snow, a weekend trip to the mountains seemed like a really good idea. So, we booked a room in Wrightwood for Super Bowl weekend, at which point, most of the snow had unfortunately melted down, but there was still enough to enjoy some sledding and snowball fights, while being warm enough to wander around the quaint Wrightwood downtown without having to break out the full snow gear. The first of our stops was The Grizzly Cafe, a review of which will kick off a series of posts on various stops we made during the weekend. The Grizzly Cafe is a cozy little restaurant built to resemble a log cabin, with nifty swing seats outside with a great view of the surrounding mountains. Inside the dining room is small, so even on a quiet Friday afternoon we had a bit of a wait for a table. However, there is a cute little gift shop that doubles as a waiting area, filled with both touristy bits and local crafts that are fun to look through. I ended up adding to my sock collection with some warm “Grizzly Cafe” branded socks. But soon enough we were seated with a view of the small bar area behind the dining room, which featured an animatronics moose head that would follow you as you walked by. The decor itself looked exactly as you would expect a rustic little restaurant that obviously caters to tourists during the ski/snowboarding season to look. All wood carvings and interesting rustic gear like the old leather saddle that adorned a shelf next to our table. The menu covers pretty much everything you would expect to find at a diner – sandwiches, hamburgers, hot wings, potato skins – all the classics are represented here, so if you’re looking for a decent meal before hitting the slopes that isn’t the chain offerings from down in Hesperia, you’re sure to find something you like here. Price wise, it was pretty comparable to a stop at Big Boy’s, perhaps a little more expensive than the other offerings in town (more on them later), but relatively free of the “tourist” mark up I’m used to bracing for at these kinds of places (or maybe that’s just the expectation that comes from living a stones throw from Disneyland most of my life). We started with potato skins, which were tasty, but unremarkable. Retrospectively we could have skipped them, but David’s search for the perfect potato skins rivals my own search for Monte Cristos. The search was declared to still be on after these. As such, I was pleasantly surprised to see a Monte Cristo on the menu, something that’s been surprisingly difficult to track down in Orange County. I ordered it with the sweet potato fries, my current carb side of choice. 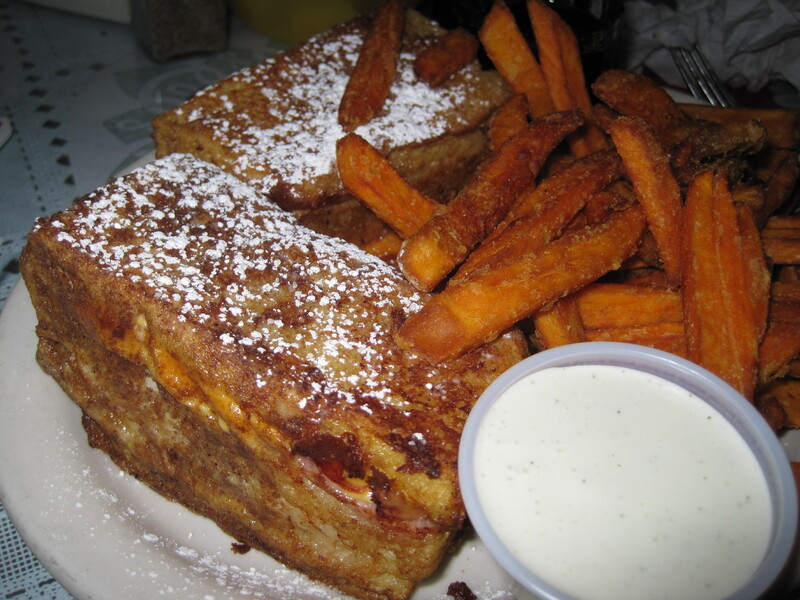 The sandwich was a perfectly fried square – crispy on the outside, fluffy, yet creamy on the inside. It was likely the best Monte Cristo I’ve had in years, better even than the famed Disneyland ones, and certainly cheaper. The sweet potato fries did not disappoint either – although I’ve had better. The portions however – this was something we never quite got used to while in town, but the portions are HUGE. David and I agreed later we should just have gotten one Monte Cristo and shared. The sandwich was so good, I finished 3/4 of it, but the fries went back to the room in a “to-go” box to be noshed later. David ordered a patty melt, which was served on thick slices of toast which appeared to be the same bread used on the Monte Cristo. The patty melt was also of large size and David reports it was most tasty. It must have been, because it was devoured long before I was done with mine. I did get a taste of the house made potato chips served with it, and those were quite good – crispy and not too thick, although a tad lacking in salt (easily added though). However, in the future I’d avoid ordering the pasta. Or at least the alfredo sauced one. The little one ordered a helping of linguine with alfredo sauce off the children’s menu and the sauce was very bland, and the portion far too large for a children’s plate. In retrospect, we should have stuck with our usual rule of just sharing an adult plate with her, but since she has little love for either Monte Cristos or patty melts, we let her order her own thing. All in all, The Grizzly Cafe was a tasty filling stop and a good choice if you just want to stop off along the main road on the way up to Mountain High or after a day of enjoying the Angeles Forest area. The melt was indeed quite delish. Hit the spot… the place had a nice folksy ambience, too. Fun place to hang out a bit.